Uh-oh, it's a girl. For new fathers, understanding the world of girls can be puzzling - what with their obsessions for fairies, mermaids, pink, glitter, ballerinas, and, well, tea parties. 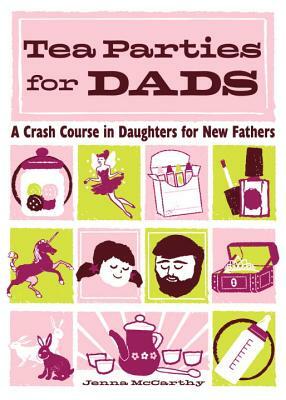 Tea Parties for Dads is a guide for new dads, with key topics that all good fathers should know and understand if they want to know and understand their daughters&#8212;from dress up to dolls, from horses to magic and spells. With a smart sense of humor, parent/author Jenna McCarthy explains just what's so fascinating about all things pink. Tea Parties for Dads gives fathers some cool insider knowledge, a reading list, or a fun activity to connect with their little princess. You can give a little girl a toy truck, but it had better be pink, glittery, or both!